July marks the best VIX buying opportunity of the year. October marks the best VIX selling opportunity of the year. Our VIX seasonality chart is based on 25 years worth of daily closing price history. The chart below compares VIX seasonality with actual 2014 VIX performance. 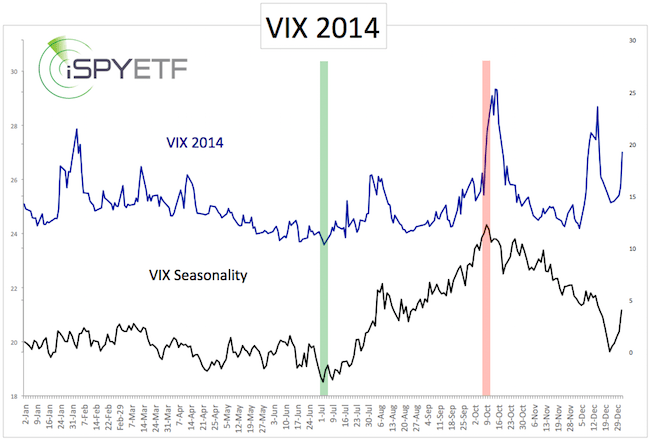 The major seasonal VIX turning points were spot on in 2014 (the Profit Radar Report pointed out both of them). 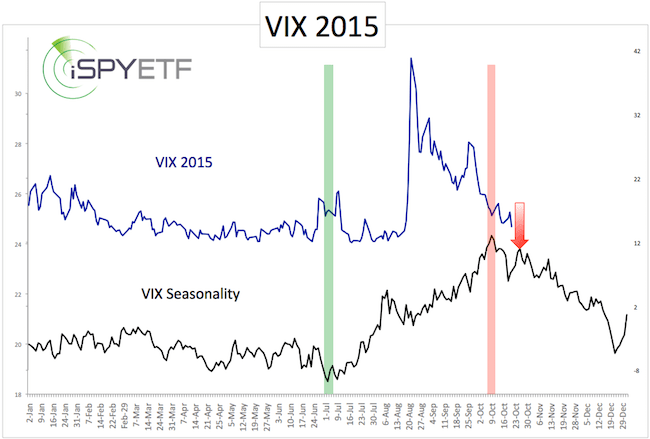 The second chart compares the 2015 year-to-date VIX with VIX seasonality. The seasonal 2015 VIX low arrived a bit early (June 23 instead of July 2). 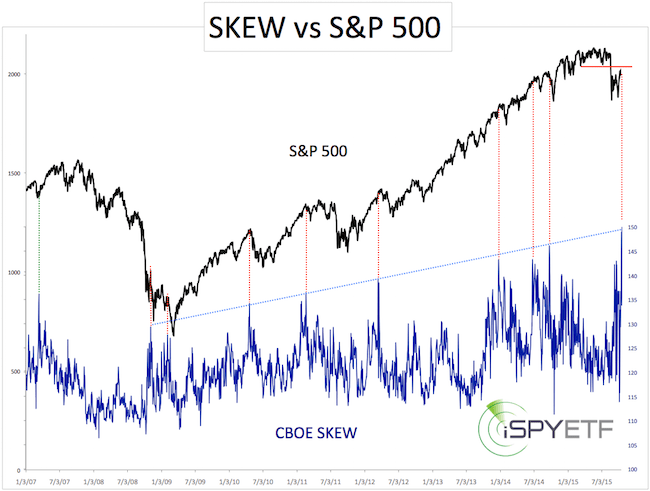 The summer VIX spike occurred during the time of year where the VIX is expected to rise. The actual VIX high, however, occurred before the October seasonal high. Based on seasonality, there should have been another VIX spike in October. There are still a few days left for the VIX to turn lower, but the August panic VIX high certainly won’t be exceeded in 2015. Seasonality is pointing towards lower VIX readings until mid December. However, I would be remiss not to mention that big outlier moves, like in August/September, may alter the ideal VIX path. That’s why the Profit Radar Report augments seasonal research with technical and sentiment analysis. After a number of failed attempts, gold surpassed red trend line resistance going back to October 2011. The weekly bar chart below highlights this fledgling technical breakout. It also shows that gold bounced from just above triple support (green trend line, green bar, black trend channel) on July 24, 2015. This is right about where we anticipated to see a solid buying opportunity. Although gold missed our buy limit at 1,070 (by less than 6 points), we ended up buying gold futures (or GLD) at 1,100 (GLD: 105.50) on July 27. Gold’s move above trend line resistance is another step towards our up side target. Next big resistance will be around 1,230 (I suppose we’ll get there before 2015 is over). Seasonality allows for weakness in October. Sentiment is not nearly as bearish (bullish for gold) as it was in July, but it allows for further gains. With trade above the 3-year trend line, it now turns from resistance to support. 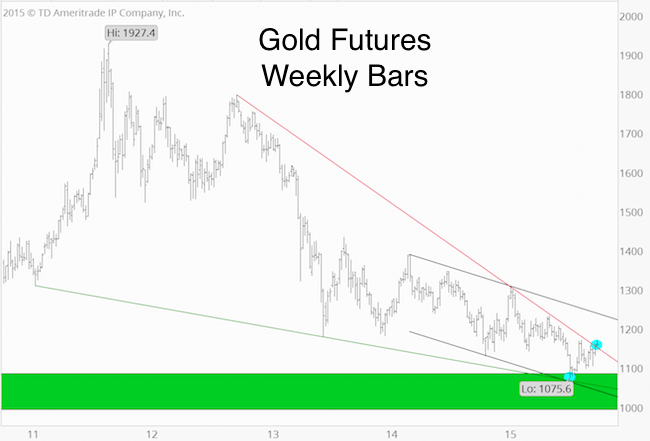 Further gains are likely as long as gold remains above support. 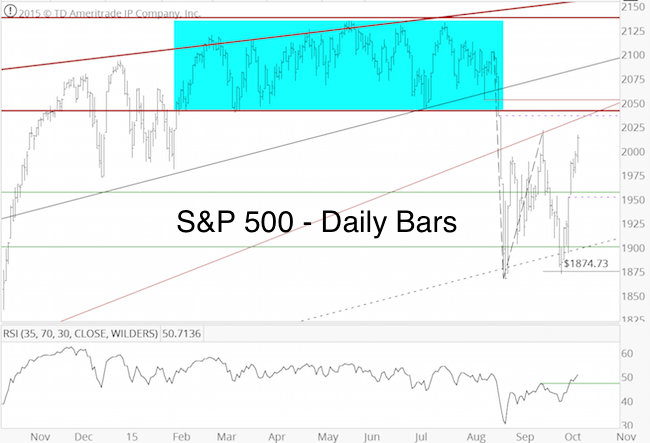 S&P 500 – New Highs or New Lows? The S&P 500 soared 150 points since the September 29 low. Based on our dashboard of indicators, we’ve been waiting for a buying opportunity. 2,040+/- is our bull/bear line in the sand. Trade above 2,040 could lead to new highs, while trade below 2,040 preserves the ideal scenario of new lows. 2,040 was support for a 6-month trading range. This support is now resistance. 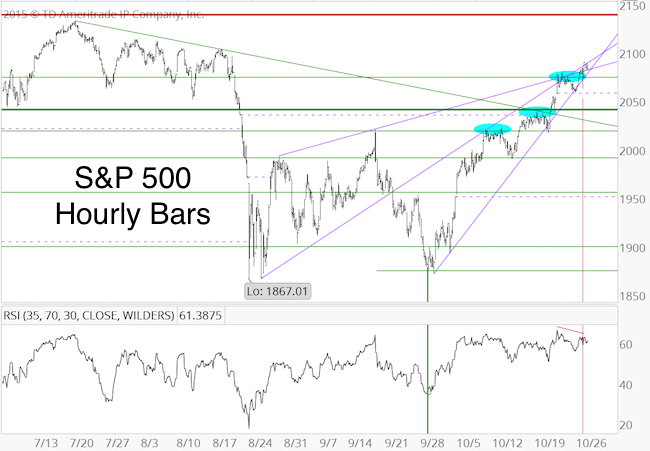 As mentioned on September 13, 2,040 is a pretty obvious resistance level on the S&P chart, and therefore may be subject to whipsaw market action (if it’s too obvious, it’s obviously …?). Because of the above-mentioned reason, the whole 2,040 region will be important, not just 2,040. 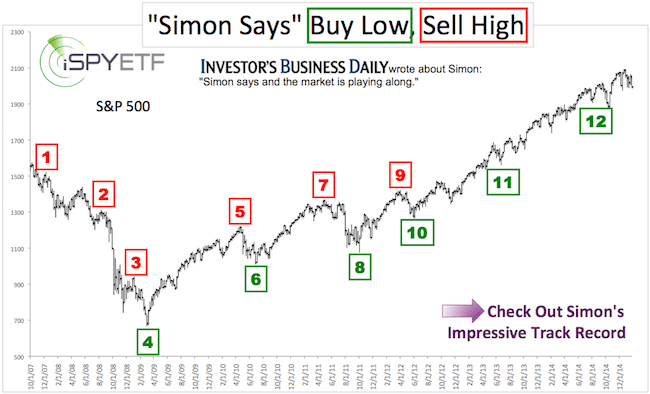 Furthermore, not just the price shown on the chart will matter, but also the market’s underlying condition. Is there hidden strength, or not? Is buying pressure overpowering selling, or is the advance anemic and susceptible to a relapse? In other words, breath, strength and liquidity matter, and may give us clues that plain chart analysis won’t provide. Buckle up. It’s gonna be a rocky ride.